But when 54-year-old Muhammed Yunis, from Cumbernauld, appeared to steer towards a slip road into a lay-by rather than remain on the A9 Inverness to Perth road, the passengers had had enough. 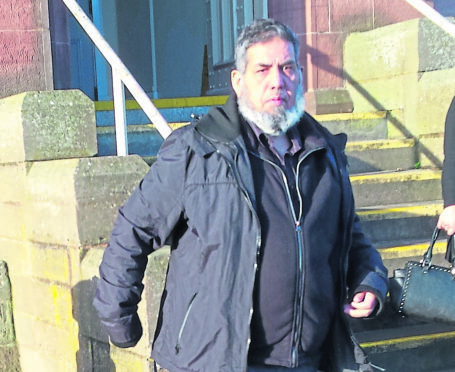 Inverness Sheriff Court heard that father-of-four Yunis realised his mistake almost too late, and sharply swerved the Parks of Hamilton bus back on to its correct path, badly jolting the passengers in their seats. Fiscal depute Niall Macdonald told Sheriff Gary Aitken that one passenger phoned her husband to contact Yunis’s bosses and another contacted the police on July 10, 2017. He was met by officers at Inverness Bus Station where he denied being tired at the wheel or feeling ill. Yunis was then charged with dangerous driving, accused of falling asleep at the wheel. But yesterday, he pleaded guilty to a charge of carelessly driving his coach and it was accepted he had not dozed off at the wheel. Mr Macdonald said: “The Perth to Inverness journey began at 2pm and there were a number of instances of careless driving during it. “He often drove too close to the verge for long periods of time, and passengers were alerted to this as the bus was running over drains and cat’s eyes. “He also drove towards the central barrier on a dual carriageway stretch , prompting one passenger to shout out ‘whoa’ before he corrected the bus. “Then near Newtonmore he was headed towards a lay-by with a slip road and there was a very late correction. The passengers were jolted in their seats and they were so concerned about their safety, that one woman phoned her husband to contact the bus company. Mr Macdonald said that when officers spoke to Yunis, who has since lost the job he had held since 2006, he said he suffered from diabetes but it did not affect his driving. Defence solicitor Ryan Templeton told the court his client had been “ill with worry” over the case and was on sickness benefit.